Sam Smith doesn’t really fit the stereotype of a bike riding artist, illustrator and philosopher. Six foot three inches tall, large framed and with closely cropped hair he’d probably look more at home on a rugby pitch than perched on the saddle of a skinny road bike. But his talent as an artist is unquestionable. 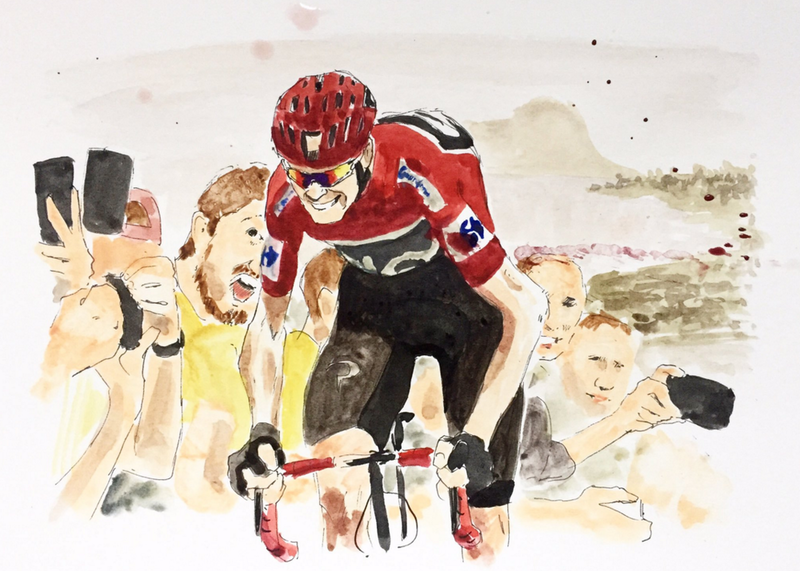 His recent watercolours depicting scenes from the Vuelta a Espana were immensely popular and sold out quickly after he released them for sale at the end of September. 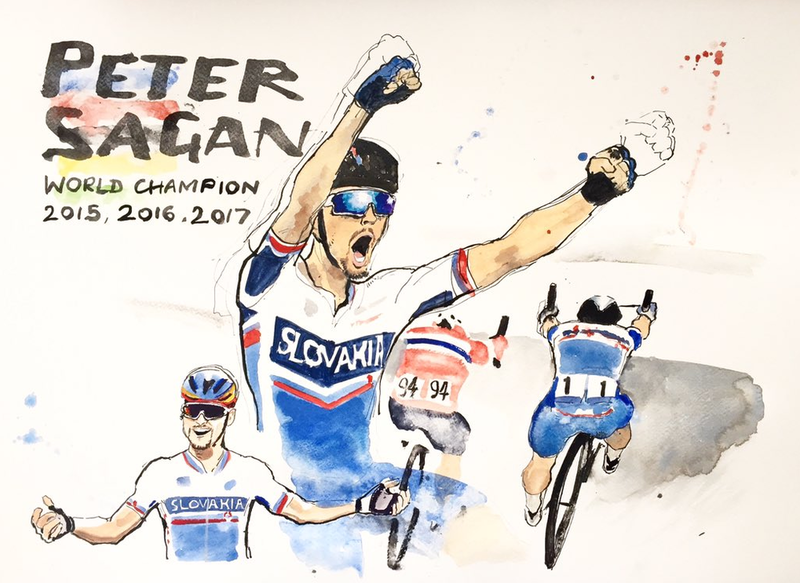 He has an uncanny ability to, not only capture the physical features of the riders, but is able to distil the very essence of the emotion and drama of the day, including details of crazy fans on the side of the road and boldly splashing swathes of paint for effect. 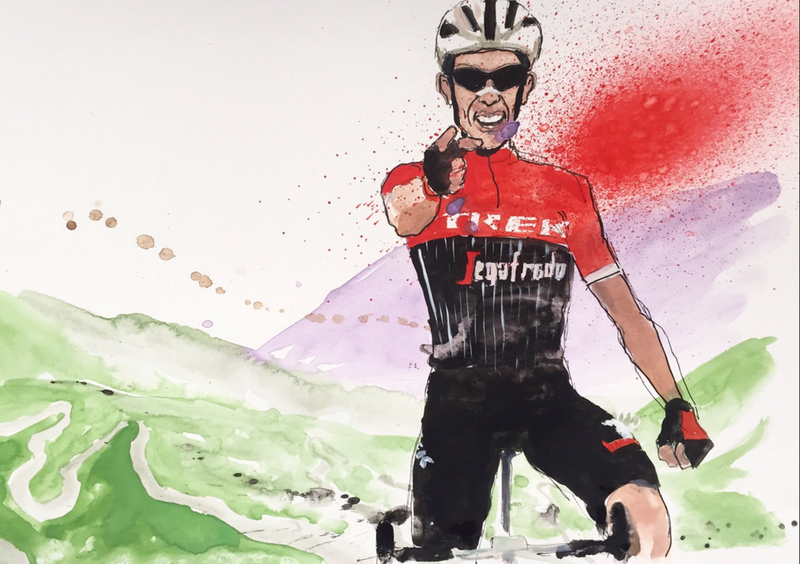 Working from his flat in London he follows each moment of the stage on TV and recreates the key moments with deft brushtrokes that belie the fact that he’s many miles away from the physical action. Like many of the rest of us sitting at home he has a fan’s view and is swept along by the emotion, suffering and determination of the riders. While we’re all tangled up in knots with the suspense, Sam is hard at work with his paints. The result is that he’s able to depict all this in a vivid, visceral style. In a rather neat circular fashion, one of Sam’s latest customers to buy one of his works was Eurosport’s Carlton Kirby, the very same person that Sam listens to commentating on each day’s racing. The daily videos that Sam posts on the Captain Smith website of the artist at work give a fascinating insight into the whole process as well as how moved he is by what’s going on in front of him. 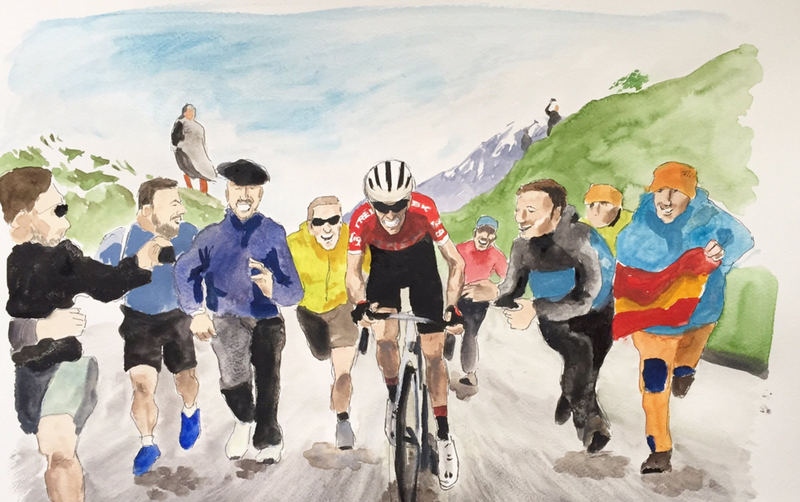 Painting Contador’s final fairytale victory on Stage 20 on the slopes of the Angliru he is visibly choked up on the emotion of the moment and has to wipe tears away from his eyes. 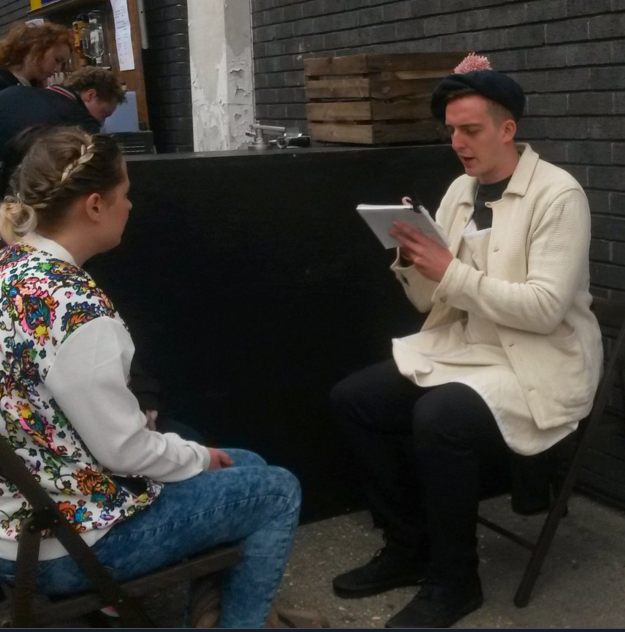 It comes as no surprise that Sam has been an avid fan and follower of the Spaniard’s career. “I think I really identified with him and loved his style of racing. He just never gives up.” But he’s also an admirer of Chris Froome and struggles to understand the antipathy many people seem to have towards the four time World Tour winner. The experience has not only developed his skill as an artist, but was formative in shaping a profound outlook on life. Delighted to be able to earn his living as an artist, something he’d always wanted to do, he describes how the intensity of the work was like an out of body experience at times. The blog posts on his website have titles like, “How to uncover your dreams”, “Follow Your Guts!” and “Why I do what I do,” revealing a sensitive and thoughtful character who is often searching for a deep meaning and purpose in life. Sam has plans to make prints of his works and we’re very excited here at Ride Velo at the prospect of selling them in our online shop. So, if you missed out on the sale of his original works, watch this space for an opportunity to acquire your very own signed print! I suspect that here is an artist that we’ll be seeing a lot more of in the future. It surely won't be long before a publisher is commissioning him to illustrate a raft of cycling books. One to look out for!